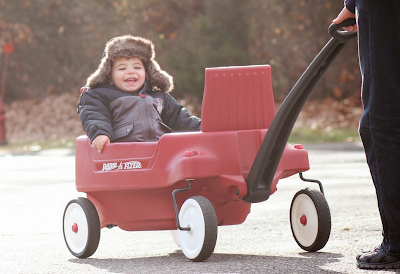 I'm a little obsessed with researching toys and seeking out the best ones for my son. 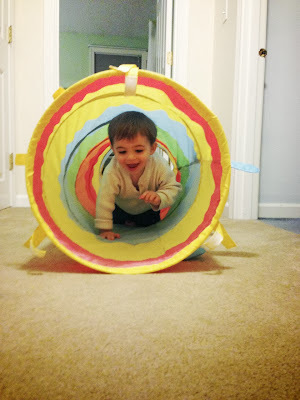 I've compiled a list of what I think are perfect Chrismakkah gifts for your little one. Now before I tell you to go out and spend a fortune- I have to admit that I buy almost all of his toys used/second hand. Craigslist, Kid to Kid (my local consignment shop), eBay and friends with kids who've outgrown toys is always my go-to. I also compare prices and use coupons whenever I buy new. 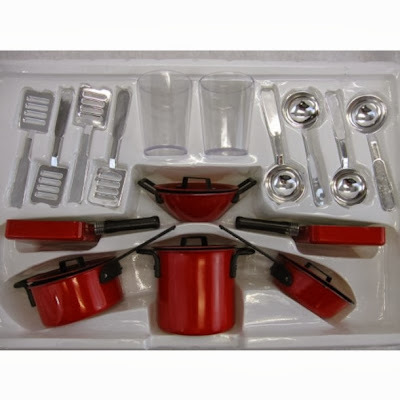 I saw this play kitchen on a blog and I instantly wanted to have it. It's about 7 years old from Pottery Barn so I knew my options were limited. I searched craigslist and there it was in a town not too far away. Dylan has played with the kitchen multiple times a day since he got it around his first birthday. 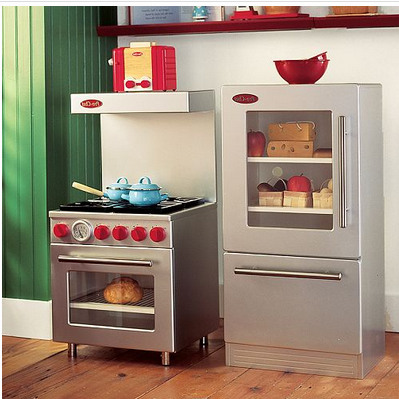 A play kitchen for a boy or girl is a must. I recommend one that has multiple doors to open, buttons to click and things to do! I also like the wooden ones because I think they look nicer than plastic if you're going to keep it in a room other than a play room. And it's better for the environment! Win! We keep ours in our kitchen and it matches our real appliances. It is by far my favorite toy we've gotten for Dylan. I got a bunch of these sets from Dave's cousins whose kids outgrew it. Dyl loves playing with the farm, bus, village, airplane, fire and dump trucks. I got a big bag for ten bucks from my local consignment shop but they are pretty cheap on amazon too. 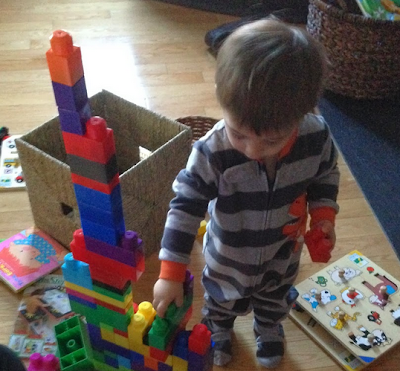 Playing and knocking over the towers we build is a nightly pastime. 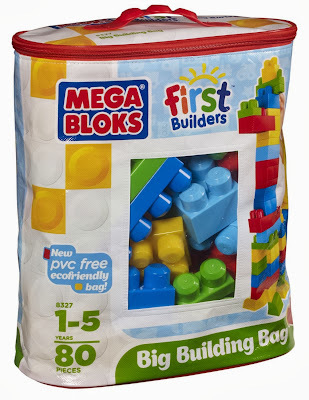 We are also teaching him to put the blocks back in the bag which is exciting that he is learning to clean up. Dylan Loves puzzles. I got a bunch from Dave's cousins but I've bought a few too. I lucked out by buying some at toys r us when they were having a sale. Home Goods also had a ton of puzzles too! 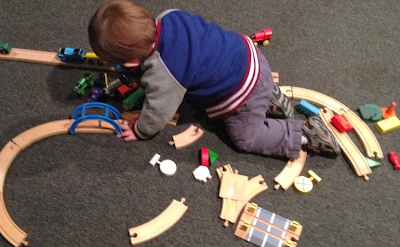 Dylan loves Thomas the train and I knew buying tracks/bridges and trains would be a big hit. Problem is Thomas trains are 12-15 bucks each! I knew he would destroy them so I decided to take a gamble on eBay. I got an entire set with multiple bridges and about 45 assorted trains for 100 bucks. This new would have cost over 300 dollars. I also asked friends on fb if anyone's kids were done with their train sets and I got more tracks and bridges. We gave him this gift early and he loves playing trains! I consider this a real cheap gift. We bought the pool for 8 bucks and the bag of balls for 15. Endless hours of fun. Dylan goes in phases with this but when it's out he loves going in and out. Almost every toy we got last Christmas Dylan still plays with. Especially this piano, puppy, remote, learning table, soccer ball, lantern, camera and laptop. 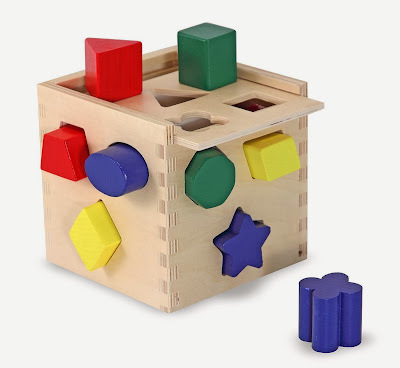 Dylan received both a Fisher Price Shape Sorter and a Melissa and Doug Shape Sorter last Christmas but recently started showing a huge interest. He can put every piece in the correct spot on his own now. We have SO many books and keep getting more. He just got Richard Scarry Cars Trucks and Things that Go, Best Word Book Ever and What People Do All Day and loves to look at all the pictures and find objects we ask him to find. 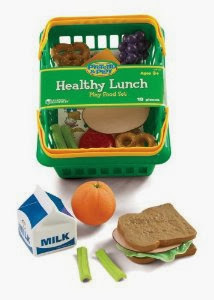 Any Karen Katz flap books are great as well as Fisher Price Little people flap books. We also love Berenstein Bears, Eric Carle, Dr. Suess, Goodnight Moon, Goodnight Construction Site, I Love you Through and Through... really the list could go on and on. But the links I provided above are so great for toddlers. 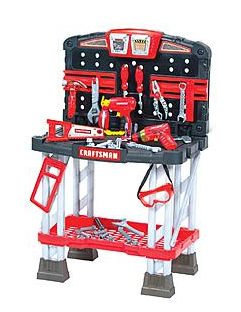 This was another gift he got last year (actually truth is I bought it for 65% off when I was getting a key made at Sears Hardware after Christmas! )We bought him the My First Craftsman Tool Work Bench and he loves this thing and has figured out how to screw the bolts. It's pretty hi tech. Highly recommend! I think this was one of my best craigslist finds. 65 bucks for the Mammut round ikea table (they no longer sell it) plus 4chairs and two stools. 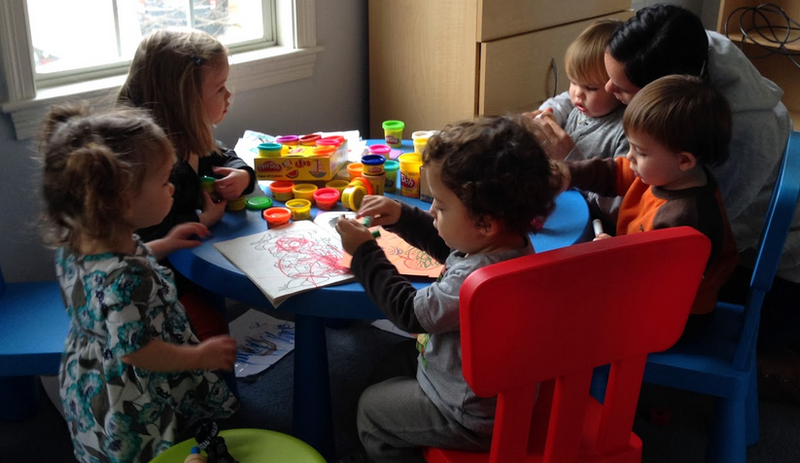 We sit at this table and play with Play Dough and color! This is a hit with Dylan and pretty much every kid that comes over. 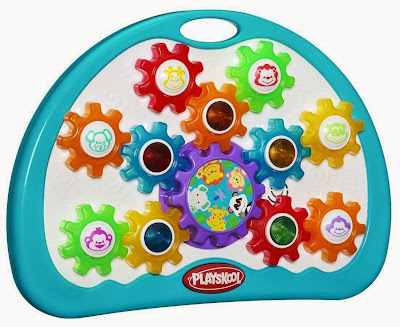 You can stack the gears on top of each other, move them around and hit the button to make them turn. I lucked out and picked up both Tickle me Elmo and Hokey-Pokey Elmo for $3 bucks each at a Yard Sale. 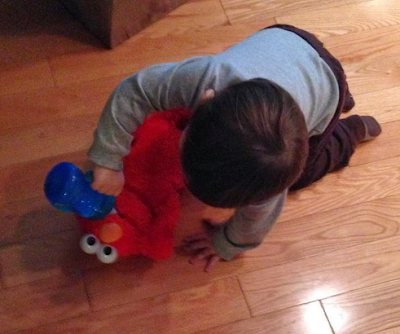 Dylan treats his Elmo's like his babies. He gives them milk, tucks them in at night, dances and hugs them all the time. This is totally an item you should try to find on Craigslist. What kid doesn't love Elmo? In addition to the toys you see, we also have a lawn mower, a water table and slide and swing. All great items to have for playing outside! For his second birthday, I plan to get a scooter for him! 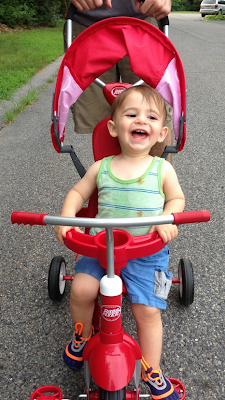 My friend Gretchen recommends Bruder and Tonka trucks for her son. I recently bought a few CAT trucks from Zullily. But really any 'truck' you get will make your kid super happy! Dylan loves to sit on trucks that are not meant to be ride-on. I think it's one of his favorite things to do. So that's my list of Dylan's current (and hopefully future) favorite toys. 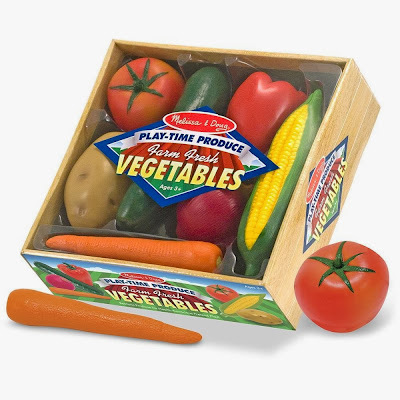 If you're a mom, I'd love to know your favorite toys your little ones. I always love recommendations from others! Add it to the list in comments below! Hi Blog Friends! Remember me? So it's almost Thanksgiving and in my old blogging days, my Thanksgiving posts were some of my favorites. Since a few of you, (okay mainly only Melissa), asked for my menu, here it is! I'm hosting a small group of only 7 plus three toddlers so we don't NEED a ton of food but of course we have a full menu so there will be plenty of leftovers! Now that I'm a full-time working mom of a busy toddler (a topic I've drafted up in a blog post at least ten times and want to talk about at some point), I knew I had to really divvy out the dishes. My mom and mother-in-law love to cook as much as me so I'm only making the stuff in RED. Still A LOT, but I'm not overwhelmed! In case you're interested in some recipes, here you go! For the turkey, we buy Brine and follow the directions on the package. This year we bought a 20 pound Fresh Turkey and we're going to start the brining process tonight. The biggest advice I can give is to make sure you have a brining bag, it makes the whole process cleaner and easier! Put the oven rack in the lowest position and preheat the oven to 350 degrees. Put the turkey breast side up on a rack in a large roasting pan, tucking the wings under and tying with twine. Tie the drumstick together as well. Put tinfoil over and cook for about 15 minutes per pound. We cooked for about 3 hours with the foil and an hour or so without. When we took the foil off, we added the Classic Herb Flavored Butter and smothered it all over. We also added chicken broth to the pan and basted the turkey throughout the cooking process. Roast until the skin is golden brown and a thermometer inserted into the thigh registers 165 degrees. Then Transfer to a cutting board and let rest for a bit before slicing. Pulse 2 sticks of softened butter in a food processor with 1/4 cup of maple syrup, 1-2 chipotles in adobo sauce (depends on heat level), 1 garlic clove and a pinch of salt. Process that up and reserve for the Gravy. You will have lots leftover! I saved all of it and decided to make a classic herb butter for the actual turkey itself. Mix 1 stick of softened butter with parsley, sage, thyme, rosemary, teaspoon of pepper, shake of paprika and salt. Process that up. Spread it under the turkey skin and on the breasts and legs. Then rub the rest on top of the skin. When turkey goes into the oven, start the broth: melt butter in a large saucepan over medium-low heat. Add onion/leek (and turkey giblets and neck if you have them) and cook until browned about 15 minutes. Add the broth, herb sprigs; cover and simmer while the turkey roasts, about 2 hours. Strain broth and keep warm. When turkey is done, transfer it to a cutting board and pour all the pan drippings into a degreasing cup. Add 1/2 cup of the prepared broth to the roasting pan and scrape up the browned bits with a wooden spoon. Add bits and liquid to a degreasing cup. (I didn’t have a degreasing cup, so I just used a measuring cup… the fat will rise to the top… so after it does that, use your baster to remove the fat). Next, make a roux. I did this in the same pan I had my broth in all day. I added a bit (maybe 3-5 TB of the chipotle maple butter and flour together until the flour browns slightly. Then I gradually added the broth back in whisking constantly to avoid lumps. Bring to a boil and then reduce to medium low. Season with salt and pepper and add more butter in if necessary (I think necessary). Enjoy the best gravy of your life! Wash and pick over cranberries. In a saucepan bring to a boil water and sugar, stirring to dissolve sugar. Add cranberries, return to a boil. Reduce heat, simmer for 10 minutes or until cranberries burst. Add in juice and zest. Remove from heat. Cool completely at room temperature and then chill in refrigerator. Cranberry sauce will thicken as it cools. Cut the Brussel Sprouts in quarters, put on baking sheet with salt, pepper and olive oil and bake at 350 until browned. Add olive oil to hot pan over medium heat and cook chopped pancetta. 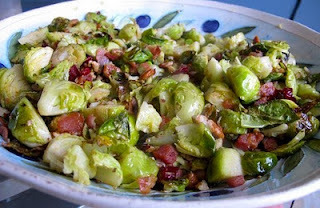 Remove half the pancetta fat and add the roasted sprouts back in with pancetta. Off the heat, add in the pomegranates. Season with salt and pepper as needed. Saute the sausage in a large heavy skillet over medium-high heat until cooked through, crumbling coarsely with the back of a spoon, about 10 minutes. Using a slotted spoon, transfer the sausage and drippings to a large bowl. Melt the butter in the same skillet over medium-high heat. Add the leeks, apples, celery and poultry seasoning to the skillet and saute until the leeks are soft, about 8 minutes. Mix in the dried cranberries, sage and rosemary. Add the mixture to the sausage, then mix in the croutons and parsley. Next add the chicken stock a little at a time until the stuffing is very moist. Be sure not to overdo it; it shouldn't be mushy. Season with salt and pepper. Place in a casserole dish. (The stuffing can be made to this point 2 days before Thanksgiving, refrigerated. )Bake in a 14-inch oval or 9 by 13-inch rectangular casserole dish and place, uncovered, in the oven for 20 to 30 minutes, until the top is crispy and the center piping hot. Remove and serve immediately. Melt Butter of medium-low heat. Add Almonds (SLICED) and cook until golfen. Remove from heat, add lemon juice, Wipe skillet off and add a cup or two of water and add some salt and green beans. Once it comes to a boil, cook for 3-5 minutes covered until beans are crisp. Drain beans and then toss with butter almond mixture right before serving. To me, this recipe is a must. It's a great recipe if you have a vegetarian in your family! Preheat oven to 400 degrees. Toss squash with 1 tablespoon of olive oil on a baking sheet. Sprinkle with salt and pepper. Bake until tender- 20-30 minutes. Whisk eggs in a bowl, add half and half, wine, mustard, and salt. Whisk together. Add the baguette pieces into egg mixture. Let soak 30 minutes. At the same time, head 2 tablespoons of oil in a large pot over medium high heat. Add onions and saute until soft then add kale, cover and cook until kale is wilted but still bright green. Reduce oven to 350 degrees. 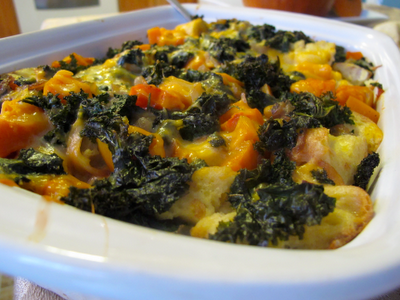 In a 13x9x2inch baking dish, transfer half of the bread mixture, squash and kale then sprinkle half of the cheese. Repeat with remaining bread, kale, squash and cheese. Pour the rest of the egg mixture over the bread pudding. Cover bread pudding with foil and bake 20 minutes. Remove foil, bake uncovered until custard is set about 20 minutes longer. Once cheese is browned, remove and serve! Hope you all have a lovely Thanksgiving filled with lots of delicious food! Over July 4th week, we rented a house in Brewster on Cape Cod. As I've mentioned on this blog before, one of my besties Stephanie owns a house in Brewster (and you should check out all the home improvements she's done on her blog). In the past, we've stayed at her house for the 4th, but with both of us having babies we opted for our own place this year. It was a great week- half the week was cloudy and the rest of the week was an absolute heat wave, but we still managed to enjoy the beach and lobster almost daily. Of course, on our first day we had Lobster and Corn on the Cob. Have to start the vacation off right! We bought our lobster from local gourmet store Ring Bros. Marketplace in Dennis, MA. The place is absolutely awesome and family owned and operated for over thirty years! My good friend from work- her family owns the place- so we always make sure to go there for all of our grocery needs whenever we are in the area. We also visited the local bay beaches in Brewster daily, even on the cloudy days. Dylan absolutely LOVED the beach especially during low tide when he could walk up to all the boats. Another great spot we visited quite frequently was JT's Seafood in Brewster, MA. They had awesome Hot Lobster Rolls, Delicious Seafood and Ice Cream. I highly recommend it! We also made it to Grumpy's in Dennis, MA for breakfast a few times. One of our favorite meals was this Lobster Eggs Benedict. I also shared these Oatmeal Belgian Waffles with Fresh Fruit and Whipped Cream with Dylan and he loved them! On one of the cloudier days, we went on a hike through Nickerson State Park and Stef and I tested out wearing the babies on our backs. (It was fun, but heavy). The Park had great trails, campsites and small beaches where the babies and dog could run wild. But the highlight was definitely going on the boat! 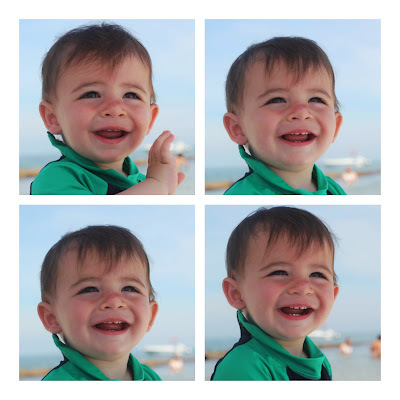 Dylan has been on a boat before when he was only a month old, but I think he enjoyed it a lot more this time around. I even got him that life vest for only 20 bucks at the CVS up the street. Score! Dylan enjoyed the boat ride best from the Captain's Seat. We drove to a private beach and the boys had a blast racing each other. We also got one of our few family pictures from the trip. When the clouds finally disappeared midweek, we enjoyed some amazing sunsets from our lake-house as well as the local beaches. It was such a wonderful week and the Cape is one of my favorite places of all time. I absolutely love my home state, the city of Boston and the New England area. There are very few places where you can get to the beach and the islands in under two hours just as easily as you can get to the mountains and trails of New Hampshire and Maine. I am so proud to be from New England- I love that vacationing doesn't require much more than a car ride. "I love the city of Boston for the history, the wit and sarcasm of the people, the beauty of the neighborhoods and the passion of everyone that calls it home." This place will forever be my home and the place I love!